Happy Monday! I hope your week is off to a good start. Do you feel relaxed and rejuvenated from your weekend? We got together with some friends this weekend whom we haven’t seen almost all summer. Isn’t wonderful how spending time with friends or family can rejuvenate your soul? I went to the farmers market yesterday. Here is the yumminess I picked up. 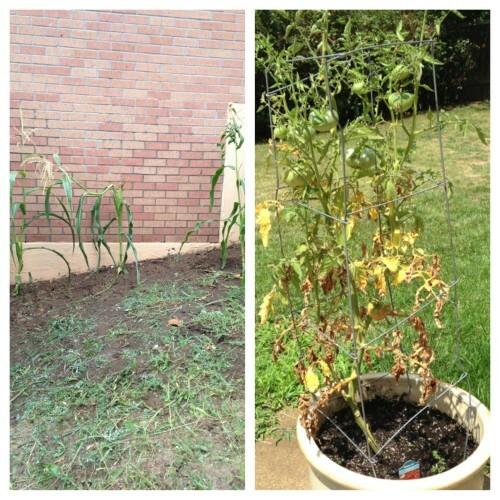 It made me sad to have to buy sweet corn and tomatoes, but you will see in the next picture that my sweet corn and tomatoes are not fairing well. In fact I pulled out all but four sweet corn plants. 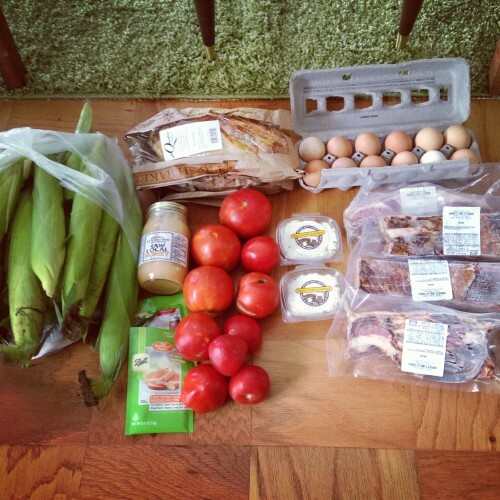 I bought four pounds of bacon and a dozen eggs fromÂ Harvest Valley Food. It is SERIOUSLY the BEST bacon I have EVER eaten! No joke! There is also some blue cheese bread from Le Quartier bakery. Blue Cheese bread makes the best BLTs. I have to give a quick shout out to Honey Creek Creamery. On Sunday at the farmers market I went to buy the same two cheeses I lost when our power went out for almost two days. The lady working the booth gave me one of the cheeses for free. How unexpected and greatly appreciated. If you’re in the Omaha area you need to try their goat cheese. I got lemon verbena and honey goat cheese and the basil garlic goat cheese. Awesomeness! As you can see I pulled out all but four sweet corn plants. These plants had the biggest ears of corn on them so I am hoping that soon I can harvest them. This is what my poor tomato plants look like. I almost pulled them out too but am hoping that maybe, just maybe, I will get some tomatoes to turn red. Usually, I have such a green thumb, but this year just isn’t my year for gardening. Are you gardening this year? How is it going? This dish I made for the first time almost ten years ago. My sister gave me a Rachel Ray cookbook for Christmas and in it was a recipe for her “You Won’t Be Single For Long Vodka Cream Pasta.” I made it and loved it. Unfortunately, I forgot about it just like I forgot about Rachel when I ditched cable (sorry Rachel!). The funniest thing that triggered my memory about that pasta dish was finding this giant bowl/platter on Kohl’s clearance rack. I picked it up and looked at it and knew immediately that a big bowl of pasta served in it would look awesome. I hope I am not the only one inspired to cook something by discovering serving platters. If you know anything about Rachel Ray, I’m sure you know how she is a fan of a quick 30 minutes or less meals. This is one of those meals. I just went with my memory on this dish and then later dug out the cookbook and saw that my proportions weren’t too far off. Thanks, brain! If you don’t do alcohol you can totally leave it out. If you leave it in you don’t need to worry about catching a buzz since the alcohol cooks off. I grilled up some chicken tenders lightly seasoned with garlic salt. Which is my go-to seasoning when I grill. Do you have a go-to grilling seasoning? I topped this dish with some fresh basil. It seems that herbs are about the only thing I can grow this summer. Add the tomatoes and tomato sauce. Use a potato masher to break down some of the diced tomatoes. Cook until heated through 3-5 minutes. Stir in the vodka and cream. Simmer for 3-5 minutes. Toss 2-3 ladles of the sauce with the cooked pasta. Pour the spaghetti on a serving platter and top with the rest of the sauce. Garnish with the basil. 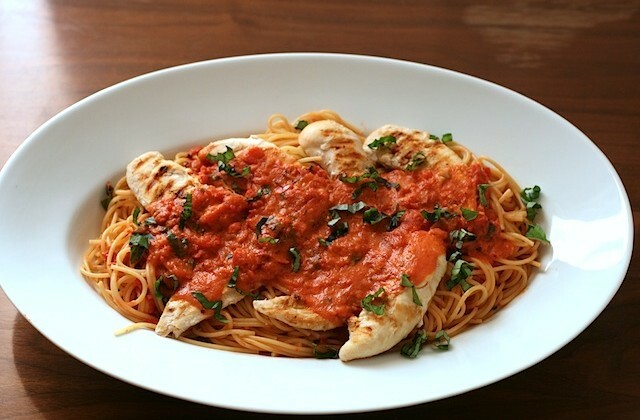 This looks like such an amazing pasta meal, definitely have me in the mood for this tomato sauce! 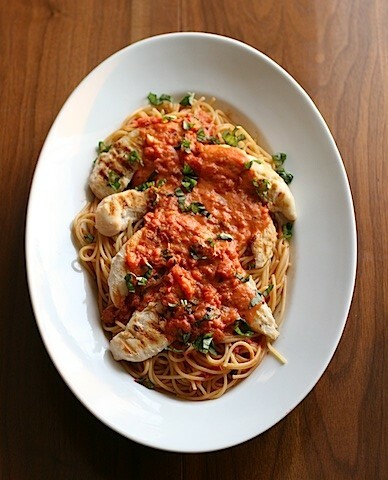 Yum, a perfect dinner…I love Vodka sauce too!